Even before taking the field for the regular-season finale, the Lufkin Panthers knew there was nothing to play for in terms of playoff positioning. Playing on Senior Night was all the motivation they would need. 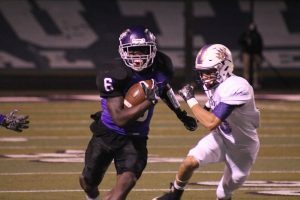 Using a balanced offense combined with another strong night from the defense, Lufkin took control of the game early and coasted from there, rolling to a 48-27 win over the Montgomery Bears at John Outlaw Memorial Field at Abe Martin Stadium on Friday night. Isaiah Phillips ran for 122 yards and a pair of touchdowns on just 12 carries, while Tre Grant ran for 87 yards and two touchdowns on 13 carries. Kewone Thomas threw for 149 yards and two touchdowns on 11-of-24 passing and also ran for another score. Malik Jackson added three receptions for 68 yards and a score. Montgomery countered with a pass happy attack that put up plenty of yards but few points until the game was well in hand. Jordan Hood completed 40-of-61 passes for 355 yards and three scores with Caleb Campbell hauling in 10 passes for 106 yards. Montgomery finished the night with 396 total yards although it needed 90 plays to get to that total. Montgomery showed from the opening kickoff that despite being eliminated from playoff contention, it wasn’t going to hold anything back as it opened the game with an onside kick. However, Lufkin’s Tyler McNeal alertly made the recovery. That helped set up a 27-yard field goal from Rodrigo Molina for an early 3-0 lead. On the following drive, a trick play turned into an interception with Jeremiah Davis making an interception on a halfback pass. However, after Lufkin couldn’t take advantage of that miscue, the Bears got on the board with an 11-play, 73-yard drive that was capped by an Alex Nunn one-yard touchdown. Jody Miller tacked on the two-point conversion on a pass from Hood for an 8-3 advantage that proved to be the Bears’ only lead of the night. Montgomery appeared to get another big play on the Panthers’ following drive when Thomas was sacked, but Phillips was there to recover it and rumble 16 yards to give Lufkin a manageable fourth-down try. Lufkin took advantage when Titan Williams hauled in a 24-yard reception that set up an eight-yard touchdown run by Phillips, giving the Panthers a 10-8 edge in the last minute of the first quarter. On Lufkin’s next drive, Thomas sent a short pass to Jackson, who sprinted 26 yards to the end zone for a score that made it 17-8. Jackson made a highlight reel play on the next drive, hauling in an over-the-shoulder 31-yard pass that set up a one-yard touchdown run by Thomas that made it 24-8 with 2:31 left in the second quarter. The Panthers weren’t done there with Jacourtney Calvin coming up with a key sack on fourth down. Lufkin took advantage on the next drive when a pass that appeared to be intended for Rylee Holt sailed through his hands and ended up in the arms of Ja’Lynn Polk, who finished off a 21-yard touchdown from Thomas for a 31-8 lead. Damond Moreland ended the first half with an interception after Montgomery appeared to be driving for a score. In the opening half, Thomas completed 8-of-19 passes for 121 yards and a pair of touchdowns with Jackson making three receptions for 68 yards and a score. Phillips did the work on the ground with 92 yards and a touchdown on eight carries. Meanwhile Jordan Hood completed 21-of-27 passes for 166 yards for Montgomery. Caleb Campbell made six of those catches for 71 yards. However, Montgomery was held to just 18 yards on 14 rushing attempts. That lead was extended to 34-8 when Molina connected on a 32-yard field goal. Montgomery ended a streak of 31 straight Lufkin points with a 16-play, 62-yard drive that was capped by a nine-yard touchdown pass from Hood to Daniel Dobis that made the score 34-14 with 3:31 left in the third quarter. That momentum didn’t last long as Jeremiah Davis returned the following kickoff 43 yards and Phillips scored on a two-yard touchdown run two plays later to up the margin to 41-14. Montgomery got on the board again on the first play of the fourth quarter when Hood hit Alex Nunn for a four-yard touchdown pass, cutting that deficit to 41-21. The Panthers took just over a minute to answer as Tre Grant went untouched for a 43-yard touchdown that made the score 48-21 with 10:39 left in the game. Montgomery went to the air to get its final touchdown of the night as Hood hit Nunn for a 13-yard touchdown pass that made the score 48-27 with 4:51 left in the game. Lufkin (8-2, 5-1) will open the playoffs on Friday night as it takes on Rockwall Heath in Class 6A Region II Bi-District action. That game will be played at 7:30 Friday night at John Outlaw Memorial Field at Abe Martin Stadium.